Here at St. Margaret Mary's we actively promote a healthy lifestyle and encourage children to make their own sensible food choices. 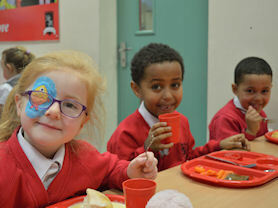 We promote the eating of fruit and vegetables at break times and ensure children drink plenty of water. 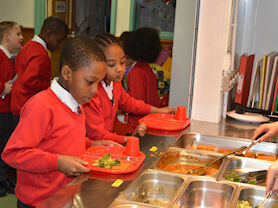 School meals are provided by Cityserve. 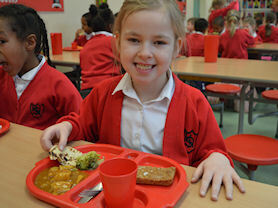 For the current cost of school meals, please speak to the school office. Any queries regarding school dinners should be directed to Mrs Cooney via the school office Mondays or Fridays. Milk is provided free to under 5's in our Nursery class if the children want it. From Reception up to Year 6 the cost per day for milk is 26p or £1.30 a week. Payment for milk can be made through ParentPay, the link for which can be found at the bottom of the page. Alongside these menus, we also link our food choices to our SMVSC days such as Chinese New Year, Australia Day and Diwali. We enjoy eating with our friends.